Providing superb Meadowlands Catering for corporate events on large and small scales in North New Jersey. 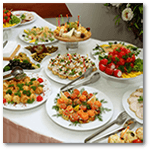 Let Simply Delicious Catering handle the planning of your next great event. Whether you’re hosting a party for a major sporting event at the Meadowlands Sports Complex or an intimate work party in the developing business community, our catering staff can create a dynamic menu and deliver quality food and customer service. We invite your to check out our extensive menus and promotions. Contact us today to schedule your next event. 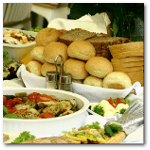 With over 26 years of catering experience, Simply Delicious Catering has tremendous skill providing catering services in The Hackensack Meadowlands. As a result, our business has developed a reputation as one of Bergen and Hudson County’s top catering establishments. At Simply Delicious Catering, we value our customers and excel at delivering memorable experiences. Whether you’d like a quaint lunch, or an extravagant gala get in touch with our Meadowlands Catering experts. Our quality menu coupled with our attention to detail makes us the perfect choice for your next business event or party. We have experience with corporate catering , parties, and special events in the Meadowlands areas of Bergen and Hudson Counties. We service the Meadowlands area, Secaucus, Rutherford, Jersey City and Newark as well as provide a flexible schedule to help suit your needs. Whether you’re looking for a simple lunch event or a full-service catered event, our professional event coordinators are ready to plan and execute. Count on premium ingredients from local sources around the natural wetlands that produce abundant vegetation, coupled with exemplary customer service. We know you will be back for your next event. Our catering kitchen is set up to provide our employees with a space that allows them to most efficiently take care of our customers. Simply Delicious Catering is setting the bar in the industry because of the awesome things we are doing. We’re setting the food in the spotlight. Our catering staff is a dedicated team of people that really allow us to excel and guide our clients execute their vision. 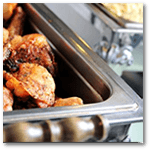 At Simply Delicious Catering, food safety is of the essence to us. 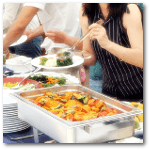 Catering is a business that relies on professionals that understand how to take care of food, properly food, and serve the dishes at the event. For us, that special care begins in our kitchen; we carefully monitor the temperature of the food from preparation to serving it, preserving its quality and assuring it is safe for our clients. Our NJ Meadowlands Catering team takes a lot of care in selecting specific plating for each dish to make certain that dish is beautifully accented and brought to life. Our food is always fresh, delicious and perfectly presented. We pride ourselves in our ability to bring the elements of your catered event together by combining the unique aspects of our diverse ecosystem and our closeness to the business, shopping, fashion and dining epicenter that is Manhattan. The Simply Delicious Catering team is trained to be familiar with the nuances of serving our clients’ events. We place high importance on a well-trained staff representing us at your event as we pride ourselves on being an honest and reputable local Meadowlands business. Our Event Specialists are truly the link to the success of your catered affair. They are the core of transforming your vision to reality, and structuring the event to set your dream in motion. 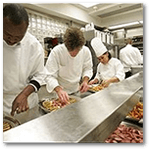 We have a professional Event Supervisors on-site to orchestrate the culinary staff at your event to ensure its success. We will work with you on all elements of what you’d like to achieve and deliver something that is totally, uniquely YOU.